Seaweed farming in the north set to benefit many farmers and the like who live there. According to Jioji Vakaca Vakawaletabua, the acting principal for Fisheries in the North is that seaweed farming is much easier than the traditional animal rearing which needs food. For seaweed farming, the farmer just needs to wait for the low tide to clean up the seaweed. “Seaweed farming is easy in that you do not have to worry about feed or other things that come along with farming or keeping livestock such as poultry or sheep. With seaweed farming, all you have to do is wait for low tide and head out to the seaweed lines and clean them,” Mr Vakawaletabua said. According to Min. 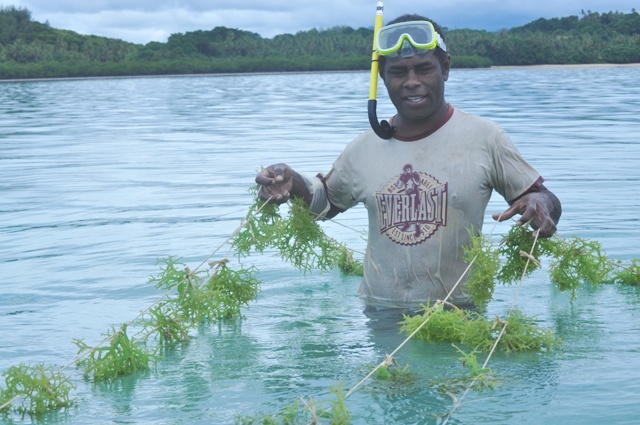 of Information, Fiji, officials had just returned from Bali to learn about new methods of planting seaweeds. Namely the long line method and the bamboo method. Farmers have hundreds of seaweed lines planted and are estimated to have at least 3kg per line with 80c per kilo when dried while it cost $800 per tonne.